Abstract: Cheat sheet for the upcoming Firebird 2. A handy reference of the FB2 datatypes, an useful query reference and a list of the PHP Firebird/Interbase functions. Since I couldn't find a Firebird SQL cheat sheet, I wrote one, listing useful information about the upcoming Firebird 2 such as its data types, its internal and UDF functions, and the php ibase functions. Update 08-11-2006: thanks to Carlos H. Cantu and Ivan Prenosil for their suggestions. I have updated the cheat sheet accordingly. The cheat sheet is organized in 5 sections. The first section contains a list of the available data types, their description and the range of values that each of them supports. The forth section contains some useful queries, like the most useful queries to manage TRANSACTIONs, SAVEPOINTs, SEQUENCEs, a sample query with a "LIMIT / OFFSET" clause, and some queries against the System Tables to retrieve a list of the tables, fields, indices and constraints. The last section holds a list of the PHP ibase_* functions . PHP has a Firebird/Interbase module and this is used by PHP developers to connect to, and query, a Firebird database. This section lists the functions available in PHP for connecting to and managing a Firebird database. 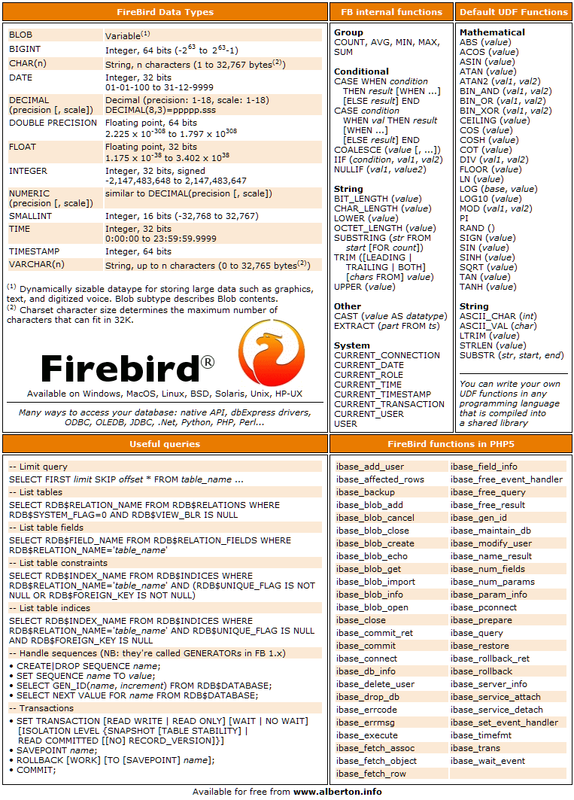 If you wish to link to the Firebird SQL cheat sheet from elsewhere, rather than linking directly to the sheet please link to this page so others can find the description. Thank you. 7 responses to "Firebird 2 cheat sheet"
Ah.. okay. So I didn't miss anything. Thanks Lorenzo, nice work. Ahh, Awesome Lorenzo for cheat sheet.Good Job. Thanks. Firebird SQL cheat sheet is really the best way to handle it. Thanks for cheat sheet info..
HowTo: Install Firebird/Interbase with PHP on Windows. A step-by-step tutorial.